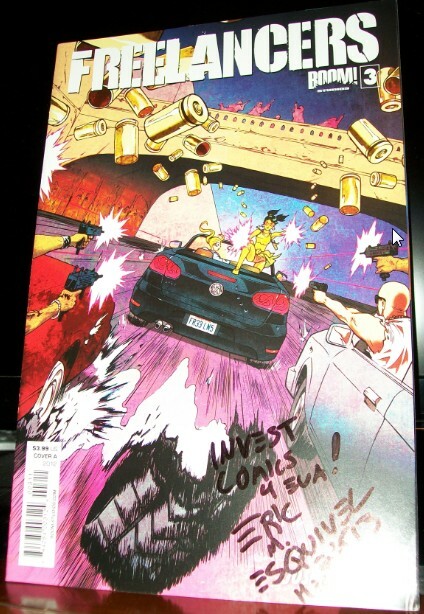 Here’s the InvestComics interview with comic book writer Eric Esquivel from MegaCon. Sebastian Piccione at the helm here. Eric was kind enough to sign one of his books; Freelancers #3 (pictured below) and InvestComics will give it away to a lucky fan! How do you win it? Easy, watch the interview and name the first graphic novel Eric Esquivel ever worked on. That’s it! A random winner will be chosen, so be sure to watch the video and get the right answer! Leave your answer either Here on the InvestComics website (below comment section), on the InvestComics Facebook page right HERE, or on the InvestComics Youtube page right HERE. Sorry, U.S. residents only. Good luck to all! Sign up to the InvestComics Newsletter! This interview was so much fun to do! Eric is awesome.